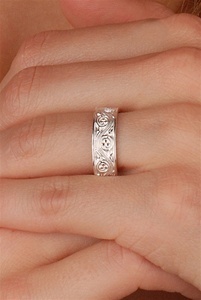 Solid Sterling Silver Ladies Triscele Celtic Wedding Ring. Excellent Quality. Made in Dublin, Ireland. This is an authentic Celtic Wedding Ring made by master artisans. This ring is absolutely beautiful. The detail in the design is impeccable, giving it a look and feel of great quality. The ring shank is a substantial weight, and the design pattern continues unbroken all the way around. I feel as though the sizing runs a bit small, but I'm giving 5 stars anyway because honestly, I couldn't be happier with this purchase.